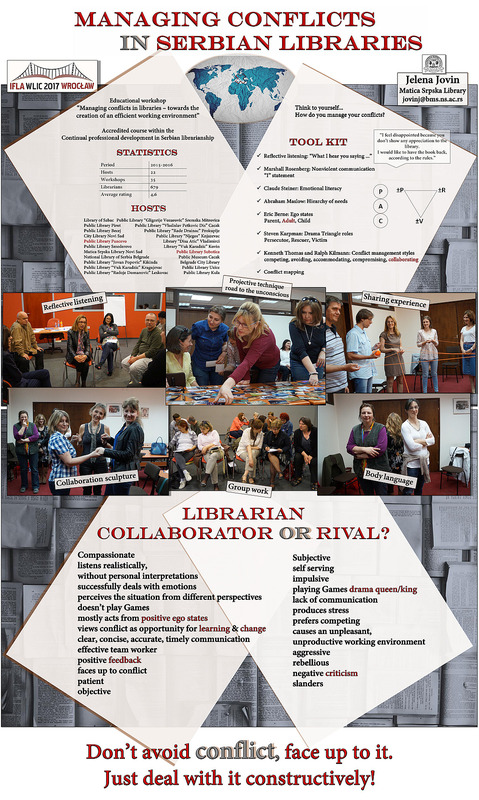 JOVIN, Jelena (2017) Managing Conflicts in Serbian Libraries. Paper presented at: IFLA WLIC 2017 – Wrocław, Poland – Libraries. Solidarity. Society. in Session 112 - Poster Sessions. Conflicts in libraries might be very destructive, painful and stressful, but also potentially challenging. It is a matter of perspective. Thus, a positive conflict resolution requires adequate knowledge and skills, and furthermore, personal change and growth. 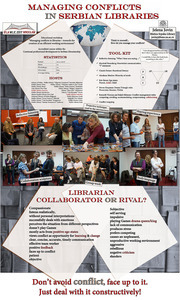 In order to promote a considerable opportunity for teaching and learning from conflicts, this poster illustrates the content, theoretical frame with tools, methods and findings from the workshop on managing conflicts, which has been held in Serbian libraries and accredited within Continuing professional development for librarians in the period 2015-2016. The applied models: Marshall Rosenberg’s Nonviolent Communication, Claude Steiner’s concept of emotional literacy, Abraham Maslow’s Hierarchy of Needs, Stephen Karpman’s Drama Triangle, ego states of transactional analysis and finally, Thomas-Kilmann conflict managing styles, have revealed certain unique and crucial facts about causes and consequences of the conflicts and expressed some ideas about possible ways of their management. Additionally, the applied workshop methods and skills: reflective listening, projective technique with photographs, group activities, sharing experience and body language, can help librarians gain insights and overcome challenges in conflict situations on both intrapersonal and interpersonal levels, such as relations between customers or colleagues. The crucial question focuses on a matter of choice between two extremely opponent styles, described in main features: communication, emotions, feedback and effects on personal wellbeing and work climate. Finally, the proactive, constructive way has been offered, as well as seeking for a more compromising and collaborating style.